On Tuesday, SpaceX will attempt to send its highly anticipated new rocket into orbit. There's a "good chance" it won't make it. At least, that's how Elon Musk -- the founder and CEO of the space start up -- put it when asked about the rocket, called Falcon Heavy, at a conference last year. "Real good chance that vehicle does not make it to orbit," was his uncharacteristically pessimistic response. Some industry experts agree. 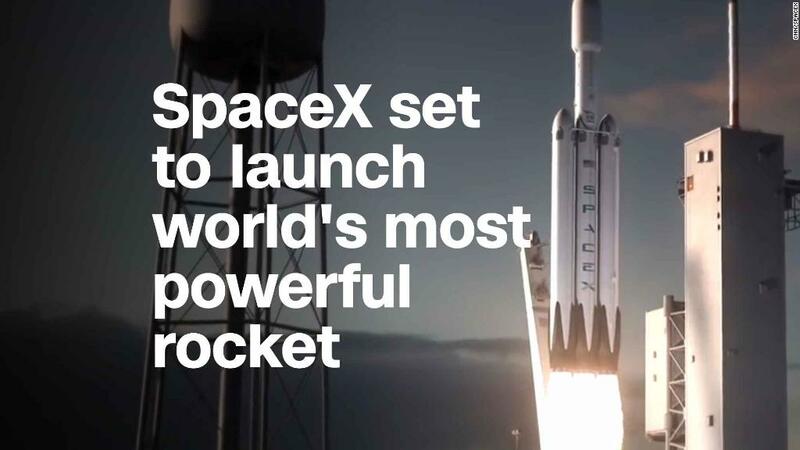 Paulo Lozano, a professor of astronautics at MIT, told CNNMoney that the Falcon Heavy -- which is poised to become the most powerful rocket in operation -- presents big challenges because of its design. "Every time you fire a rocket engine, there is a probability that something might go wrong," he said. The Falcon Heavy has a stunning 27 engines. "It will only take one of them to blow up and produce a bad outcome," Lozano said. He added that rockets like this are incredibly difficult to test on the ground, so a (potentially explosive) test flight is the only way forward. Note: No humans or expensive satellites are at risk here. Since it's the Falcon Heavy's inaugural flight, there will be a dummy payload on board -- a Tesla (TSLA) roadster from Musk's personal collection. So exactly what is at stake? "I hope it makes it far enough away from the [launch] pad so that it does not cause pad damage," Musk said last year. "I would consider even that a win to be honest." And there's a big reason why SpaceX would want to protect this particular launch pad, known as Pad 39A at Kennedy Space Center in Florida. Because of a special walkway that has been constructed for it, Pad 39A is the only site that can host flights of SpaceX's new spacecraft, Crew Dragon. That's the spacecraft the company is developing to help NASA ferry astronauts to and from the International Space Station. Crew Dragon has already faced delays. And destroying the launch pad could mean pushing deadlines back even further, according to U.S. Government Accountability Office Director Cristina Chaplain. And NASA surely wouldn't be happy about that. The U.S. hasn't had a crew-worthy spacecraft since the Space Shuttle program retired in 2011, so the government has been relying on Russian spacecraft for space station travel. But that arrangement is only guaranteed into 2019. SpaceX competitor Boeing (BA) is also working on a human-certified spacecraft. But, according to the GAO, both companies are already too far behind schedule for comfort. NASA says SpaceX is on track to launch its very first crewed mission this December -- but that may not happen if Pad 39A is badly damaged in the Falcon Heavy launch. An explosion of SpaceX's less-powerful Falcon 9 rocket destroyed a launch pad, and it took more than a year and about $50 million to rebuild. Launch pads include expensive structures that help fuel and monitor the rocket -- and are capable of withstanding the a rocket's blaze. According to the GAO, SpaceX does have the option to retrofit a different launch site for Crew Dragon, but it's unclear how much time and money that would take. SpaceX will still gather valuable data that it can use to build a better Falcon Heavy. The company won't even use the word "failure" -- because this is just a test. Though SpaceX is a private company, its partnerships with NASA and launch contracts with the military are a significant part of its business. And there are some on Capitol Hill who are quick to question SpaceX's reliability, thanks in part to some previous mishaps by the company. SpaceX is also competing with United Launch Alliance, the legacy aerospace firm that was the military's rocket builder of choice for more than a decade. The company boasts a practically flawless launch record. SpaceX's Falcon 9 rocket -- which completed 18 pristine missions last year -- broke United Launch Alliance's monopoly on military launches when it was awarded a contract in 2016. But now, as United Launch Alliance and SpaceX continue to compete for those contracts, headlines about a fiery rocket eruption aren't exactly what SpaceX needs. "There would definitely be some political fallout from a launch failure," said Bill Ostrove, space analyst with Forecast International, a Connecticut-based research firm. "There are some SpaceX skeptics that have sort of grabbed on to some of their failures, whether or not it affected their operations." Then again, Lozano said, SpaceX could be helped by some well-steered PR. "Elon has the right idea, keeping expectations low" for Falcon Heavy, he said. An industry source told CNNMoney that a Falcon Heavy explosion shouldn't delay any of SpaceX's planned Falcon 9 launches -- unless the root of the problem involves something besides the rocket, such as the fueling process or SpaceX's ground system. SpaceX has two other launch sites where Falcon 9s can take flight -- one at the Cape Canaveral Air Force Station in Florida and another at the Vandenberg Air Force Base in California.